NEW SPECIAL SEGMENT: Hilarious Mini-Speed Dating! Join in, be a part of the show and win prizes and possibly a HOT date! Whether you’re in a long term relationship or looking to date, we want to hear and share your best/worst dating experiences. MentalPause Co-Founder: Stephanie McHugh — You may remember her as the morning show host on KOOL 105, Nickelodeon's Funniest Mom in America, or Speed Dating. Stephanie delivers hilarious, quirky surprises around every corner. 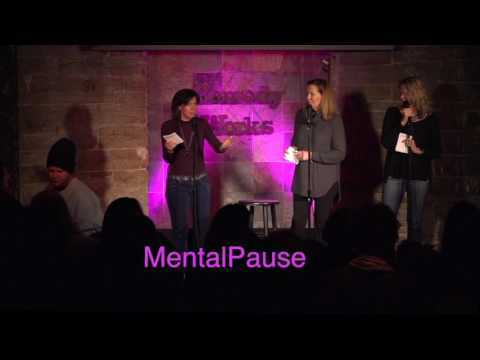 MentalPause Co-Founder: Nancy Norton — WINNER of the Boston Comedy Festival. The only woman to ever win it in the 19 years of the Boston Comedy Festival. With over 20 years of headlining experience, Nancy’s act is hilarious, fast paced and in the moment! She has been seen on A&E, Amazon Prime Video, on Evening of the Improv, Nick at Nite, and PBS in her one-woman show. MentalPause Co-Founder: Nora Lynch – Stand-up comic seen on MTV, A&E, writer for Comedy Central - Nora pulls no punches and is known for her sharp stinging wit.